Photowalk gives participants a full-Spectrum view of downtown. Each of us has a completely different perspective. This shouldn’t come as a surprise to anyone, but I feel that it’s an important point to drive home before delving into the meat of this post. All of our culminated experiences, preferences and lifestyles make for a bazillion ways to look at one thing. In this case, that one thing is Downtown Fresno. Spectrum Art Gallery partnered with the Fresno Art Museum to organize a Downtown Fresno Photowalk on Saturday August 10th. The Photowalk was in conjunction with FAM’s call to artists for their upcoming crowd-sourced exhibition, Downtown Visions, to give the Spectrum’s members a chance to capture potential submissions. I was lucky enough to be asked to put on my Tour Guide hat and be on hand for any of the photographers who might want more context for the images they were capturing. The group assembled at the clock tower at 6:00 PM. I got really excited because it was such a huge crowd of people. I loved the way they mingled with each other immediately. I learned quickly that wearing a camera around your neck was an instant “in” with this crowd. Despite my only holding an iPhone and dinky point-and-shoot I was still welcomed with open lenses. 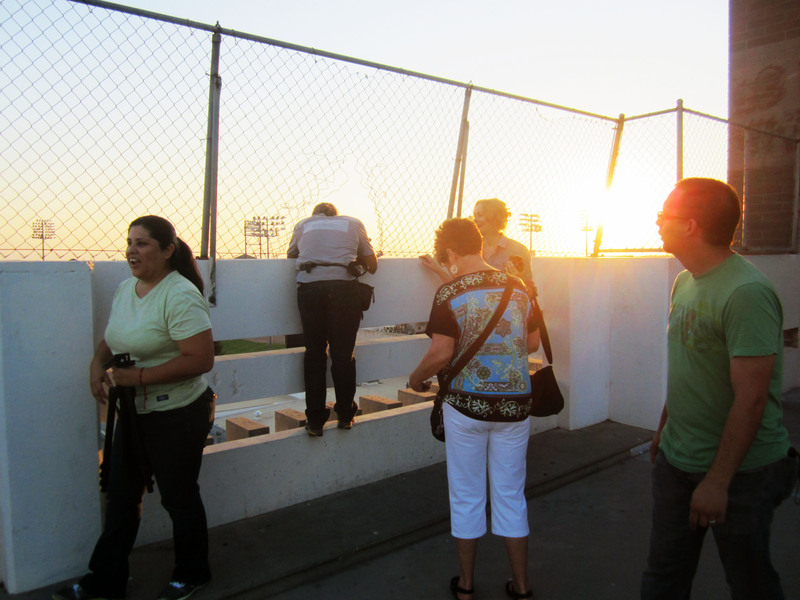 We were briefed by the Spectrum coordinators Efren Ruiz-Ortega and Cynthia Cooper on how the Photowalk would work. It was a wander-at-your-own-pace or keep-up-with-the-group if you want to situation. And we heard from Kristina Hornback from the Fresno Art Museum for more details about the exhibition. In a crazy Inception twist, there was even a photographer there to take photos of the photographers, who then asked all of the photographers to photograph him taking a photo of them. We went up to the top of the Spiral Garage to get a birds eye view of things. Which everyone took full advantage of. And the lighting was this gorgeous golden color than even my less-than-experienced photo skills were able to recognize as super cool. Inspired, I even took an “artsy” shot or two. These will not be appearing in the Downtown Visions exhibit. 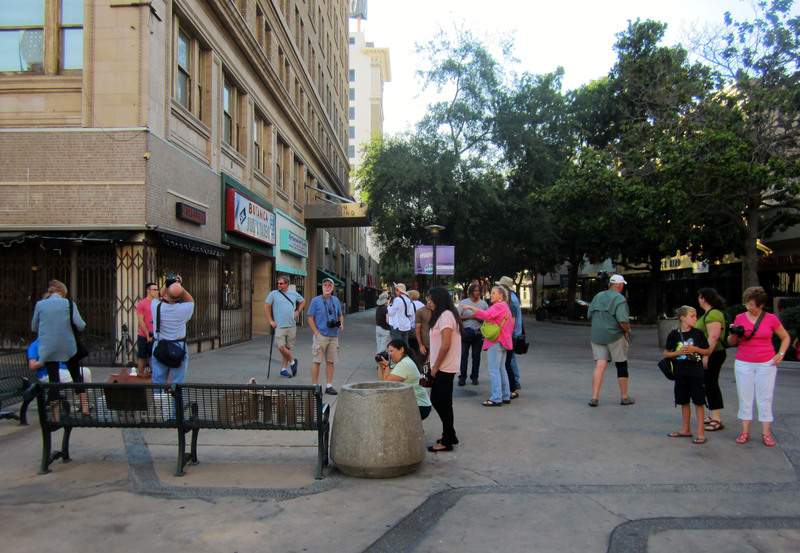 The Photowalk was wonderful in so many ways for me as the go-to Downtown resource person. Seeing all of the people who don’t come downtown often exploring the area and finding little things to get excited about as they went along was inspiring. It was satisfying for me to share my art with them- if you can consider talking loudly about things you’re passionate about an art form. Nothing brings me more joy and fulfillment than spreading the downtown love and getting new people to feel an ownership and appreciation of the deep history and exciting future of our urban core. I went home jumping up and down and talking loudly. No one else appreciated my enthusiasm as it was well after bedtime, but as momentum picks up with downtown revitalization I suspect my family will have to cope with the full Spectrum of my unbridled zeal. Thank you Spectrum Art Gallery and Fresno Art Museum for such a fun and personally rewarding outing. As an amateur photographer at best, I didn’t participate because I was too embarrassed that my not-knowing-what-I’m-doing would stand out like a sore thumb and I would be laughed at —- but now I’m sad I didn’t take the opportunity! This looked like a lot of fun. Might more of these walks be in the works? I would love to hit up Fresno State on a late afternoon to do this — a suggestion for another session for you guys maybe? !